I've been in the carpet business over 30 years, but I don't sell carpet. I'm a flooring consultant, author and nationally recognized consumer rights advocate. 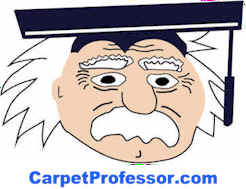 My unbiased carpet buying information, opinions and advice is featured and published in major newspapers, national magazines, trade papers, websites and newsletters all over the world. I know the carpet business inside and out and I can help you buy carpet wisely! Don't put all your trust in any carpet salesperson, that's the most common mistake consumers make. If you want to buy new carpet for your home and hope to get a fair and square deal, you have to learn a few important things about the carpet buying process first. Let me bring you up to speed. Start by reading my free articles and information listed below. Testimonials - Who saved how much? Landlord Flooring Management eBook Designed for apartment owners and property management professionals. This is the only definitive and comprehensive guide book on the subject or flooring replacements and repair. Available for instant download here.